During our first year in Japan during a trip to Brown's Fields I met my first farmer-surfer. Ioyori-san moved from Tokyo to Chiba to be closer to the ocean and be able to farm. (She's since moved much further south, though.) I asked her what she was growing, and her long list included a plant I didn't know: tsuru murasaki. She described it in detail, drew pictures, and told me how to cook it. I was fascinated and made a note to ask about it when I got back to the farm in Tokyo. Ioryi-san and I traded business cards, and drifted off to eat and tour the area. Later as we took our last photos of mulberry trees and rice fields and contemplated the long train ride home, Ioryi-san pulled up in her car and dashed over to us with a small plastic bag. Inside were two seedlings of tsuru murasaki. "Try it and see what you think," she said. Kept in pots on the balcony, those two little seedlings were felled by the double-whammy of a Tokyo summer and the neglect they experienced while we were hiking in Hokkaido. The leaves we regularly harvested for our house salads were delicious and welcome. 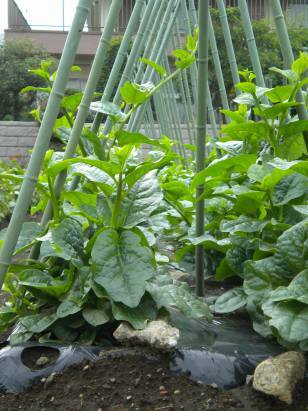 (Summer in Tokyo provides a wide variety of vegetables, but not many of them are leafy and green.) Until this year, I never saw seedlings at local nurseries, but did find the leaves occasionally for sale at nearby farm stalls where just beyond it could be seen trellised and exuberantly growing. Since then, I've met more farmer-surfers and more crazy vegetables. Last month, though, I spotted a small display of tsuru murasaki while shopping for something else at a nursery and snapped up two to set out in the new lasagna bed. A vining plant that also goes by the name Malabar Spinach Basella alba<> and Basella rubra , tsuru murasaki is a prolific grower that can reach heights of 14' or so. It prefers to be planted out anywhere from mid-May to mid-July, and can be harvested until cold weather knocks it flat. 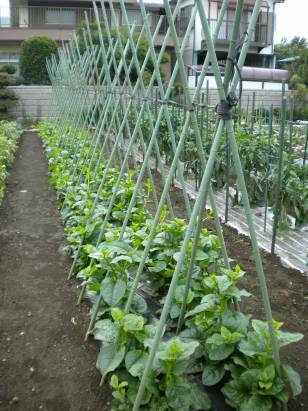 It might be a good choice for a green curtain, but a sturdy net and poles would be required. The vine is rather thick with a number of spreading tendrils, and full of weighty leaves that resemble Swiss Chard in miniature. With a taste reminiscent of spinach, tsuru murasaki is often eaten in salads, tempura, lightly steamed with a bit of soy sauce, or tossed into soups. Regardless of how it's ingested, this nutritious bit of green leafy goodness when there is little of that to be had. (It's also said to be good at managing blood sugar levels for diabetics.) That said, there's plenty of other great things to eat in Japan in summer (just visit any farmers market), but for salad fanatics like us, the leaf is what we love best! We love this and eat it every chance we get. Simply steam and season with sesame oil and a light soy sauce. Yummy! Do they have the red leaves version in japan - sometimes called Basella rubra? That's very pretty. It's a close relative of Madeira vine or binahong ( Anrededera cordifolia) which is a very vigorous and invasive tuber bearing vine with a similar taste. We grew s few Malabar spinach plants last year on our Tokyo balcony, and they didn't get very tall, because of the heat. We came to really enjoy harvesting from our plants every few days. We found that the leaves had the flavor of spinach but were thicker and flatter, perfect for sandwiches. Thanks for the background info. So glad to know their Japanese name so we can find their seeds again more easily at the gardening shop! Yukari, how long would you steam it for? One of my Twitter folks mentioned that they thought it got a bit too slimy, but I'm almost wondering if that would have more to do with length of steaming? Thoughts? Rhiz, we do indeed have the red variety here. In fact, I have one of each twining their way up the poles in the garden now. I tend to like vegetables with a bit of swingy color, so I couldn't say no to one of each at the nursery. I don't know the other one you mention. Similar texture, too?